Phantom Screens unique concept and design, along with solid build and limited Lifetime Warranty are not the only reasons that Impact Retractable Screens chose to be a distributor for Phantom Screen. It is also the vision and values of the company that inspired Phil McDonnell to commit to Phantom. He knows that Reputation is Everything and also admires these values. That results in over 25% of Impact’s business coming from referrals. Phantom Screens Values: Speak the Truth – Because Trust Matters Serve our People - Serve our customers to the best of our ability Pursue Excellence – Taking care to get things right Practice Stewardship – Staying involved in the local and global community From Installer to Business Owner . . . Owner, Phil McDonnell, is a life long resident of Central Florida and was first introduced to Phantom Screens through his installation work. Once seeing the Phantom concept and practicality of how retractable screens greatly enhance a home, he realized an immediate opportunity to represent Phantom Screens in the Central Florida area. Drawing on his 15 years of experience in the construction industry, Phil opened Impact Retractable Screens to bring this remarkable product to as many Central Florida homes as possible. MD Home Repair was created to provide responsive and skilled services for interior and exterior home maintenance, repairs, and improvements. We deliver professional expertise and craftsmanship, hand in hand, with a direct line of receptive and responsive, timely communication. You choose the design and product. We will pick up the material and install. 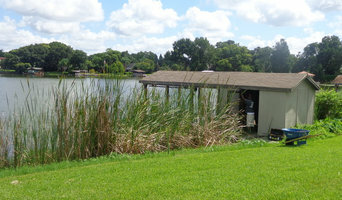 Bring the outdoors in with one of our custom built Orlando screen rooms and patio enclosures. Our custom Orlando screen rooms are built with your specifications. We provide an all aluminum, high quality, frame that is virtually maintenance free. Increase the value of your home and add protection from pesky flying bugs and mosquitos. 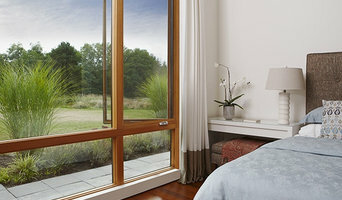 Our Orlando screen enclosures also offer the option of being converted to a glass room at a later date by simply replacing the screen with windows for an all weather room. Our Orlando sun rooms and pool and patio enclosures create additional living space and provide protection from harmful U.V. rays. With our screen enclosures you can prolong the life of pool chemicals and your pool can be free of debris and bugs. We effectively and beautifully screen in your existing porch, patio, and/or lanai! If you are thinking of remodeling your home or creating a home addition, visit us at Eden Construction in Orlando and Winter Park, Florida. We can increase the value, uniqueness, and beauty of your home through kitchen remodeling, bathroom remodeling, adding vinyl siding or replacement windows, or creating a brand new home addition, such as a screen room or sunroom. If you visit our home remodeling showroom in Winter Park, we can give you lots of ideas to get your project started. You won’t be disappointed if you choose Eden Construction to help with your home remodeling job—we’ll always make your home and your life Eden better! At New Horizons, we love the Florida lifestyle. Since we opened our doors in 2003, we structured our business to provide premium products that enhance the lifestyle of our customers. We are the premier provider of retractable screens and retractable awnings. We are centrally located and within easy reach of Metro Orlando and the Central Florida area. Our office is conveniently located in Winter Park, FL. Almost all of Central Florida is no more than 30 minutes away. We have our products set up in our showroom and we would love to have you come by. Just be sure to call first! All of our installers are factory-trained, insured and background tested. We are also an A+ rated Accredited business with the Central Florida Better Business Bureau. It is our #1 priority to ensure satisfaction from the moment of first contact and throughout the entire relationship and beyond. The best compliment we can receive is a referral from our satisfied customers. James Alan League: I have over 35 years in the aluminum industry. I opened Major League Aluminum with my son (James Scott League) my partner and the Installation Manager. In 2010 we lost James. We are still keeping the family business running in James's memory. We will make and design the patio of your dreams getting together your vision and our knowledge to create a exclusive outdoor living area! We’re committed to providing you with the highest level of service, we want to make the process as easy and enjoyable as possible for you. We genuinely care about your project and your experience. We combine Quality Workmanship, Superior Knowledge and Low Prices. We ensure a job is done on time and on budget. Action Aluminum Products, Inc. can make your personal paradise bigger and better than ever imagined. We can bring the outdoor inside. Sunny days, star light nights, balmy breezes, virtually bug and debris free, we make your pool patio more usable and enjoyable, and less expansive to maintain year around. All by enclosing it with custom design and the highest quality materials available. We strive to provide top of the line products and best in class customer service to create a one of a kind screen room for any of your outdoor recreation spots. All while building a professional and fun relationship with all of our customers!! With integrity and honesty being our core values, our goal is to provide our valued clients with top quality craftsmanship, completing every job we take on to their satisfaction. We pride ourselves on our impeccable customer service and will go out of our way to meet your needs. Our skilled and qualified Casselberry, FL contractors work with great attention to even the smallest detail! Your chosen specialist will run through your options based on your available budget and space, and discuss potential stumbling blocks such as building regulations and planning approval. A shed is typically counted as a temporary structure but every planning authority will vary in its requirements and Orlando, FL shed builders can help work through this with you. Many summerhouses on the other hand will warrant planning permission due to their size and more permanent nature. When it comes to patio installation, or decking installation in Orlando, FL, you will certainly find working with Orlando, FL decking installers and patio pavers will lighten the workload and ensure your new garden feature offers a great outdoor space for years to come! You may also want to work with a garden design professional to plan your garden space before engaging a patio or decking installation professional in Orlando, FL. This decision may in the end come down to the space you have available for your garden room. Today, there are many specialist Orlando, FL shed builders that offer high quality sheds in attractive and colourful designs that can easily be transformed into compact outdoor rooms. At its simplest construction, a garden shed is obviously a very useful storage place, whilst a summerhouse typically works as a real garden showpiece, there as a garden room to be enjoyed come rain or shine. And it can be constructed in almost any style you wish. How about a traditional log cabin or something more contemporary such as an energy-efficient modular design or a Scandinavian summerhouse of interlocking construction? Customise your summerhouse with lighting, heating and even internet connectivity depending on the core use, whether that’s a separate workspace, home gym or sun-bathed hideaway. A summerhouse can look overbearing if it’s more than a quarter of the total size of your garden so, again, check with your specialist to see how big is too big. Patios are a great place to entertain friends and family over a juicy barbecue and bottle of wine on a balmy summer’s evening. A patio looks particularly good at the front of a large garden, teamed with cast iron patio furniture, and can be constructed from a number of different materials such as stone, brick and concrete. Your Orlando, FL patio designer or patio installation specialist will be able to plan an attractive patio design which can range from a simple regular tiled layout to complex mosaic patterns. Alternatively, hardwood decking is another great way to bridge indoor and outdoor areas, separated by sliding or French doors. 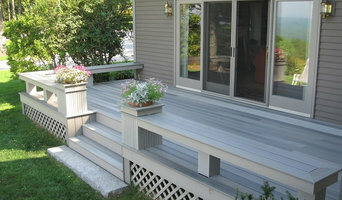 If your garden is lower than your home, consider asking your decking installation professionals in Orlando, FL to raise the deck to the level of the floor so you can step seamlessly outside. And it needn’t be a standard rectangular decking installation either. Go with the flow and add a curved border, accentuated by decking lights. If the kids are making you climb the walls, ask your expert to help you design a low-level play area, painted in bright colours and incorporating a sand pit. No kids? A gazebo or pergola will go well with that timber decking installation – the perfect spot for reading or snoozing. Search in the Find a Pro section of the website for Orlando, FL patio and decking installers as well as shed builders and summerhouse manufacturers. 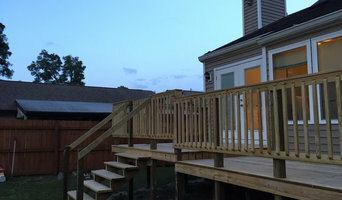 You can also look through Orlando, FL photos to find examples of decks and patios that you like, then contact the decking installation professionals in Orlando, FL who worked on them. Or look for photos of summerhouses or sheds that are tagged with the suppliers information.